SKU: Dart Solo 200-2050 2 oz. 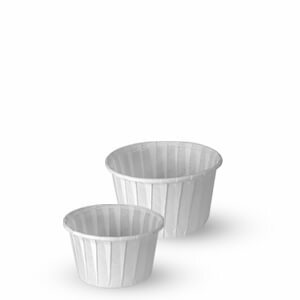 White Paper Souffle / Portion Cup - 250/Pack. Categories: DART, MEDICINE / PORTION / SOUFFLE CUPS & LIDS, PAPER CUPS / LIDS. Paper Portion Containers Economical solution for front or back-of-the-house applications. Solo® Paper Portion Containers are available in wax treated paper as the standard, with select poly-lined Paper options available for superior moisture resistance. While these Solo souffls work well for your customers, they’re also an economical solution in the back-of-the-house. 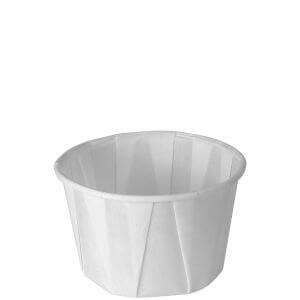 Chefs like to use these versatile cups as measuring tools. Sustainable Features: Wax Treated Paper Portion Containers are compostable in a commercial compost facility which may not exist in your community. Not suitable for backyard composting. Meets the ASTM standard D6868 for compostability. Solo represents that our Solo brand paper products are made from paper purchased from manufacturers that at a minimum have Sustainable Forestry Initiative (SFI) certified fiber sourcing.